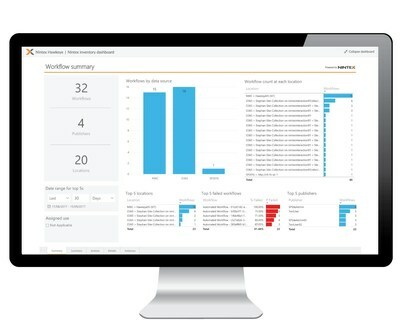 BELLEVUE, Wash., Sept. 25, 2017 /PRNewswire/ -- Nintex, the leader in workflow and content automation, has announced a set of powerful new capabilities in its cloud-based workflow analytics solution, Nintex Hawkeye, which gives customers unprecedented visibility into the operational performance and business impact of their automated business processes. Nintex Hawkeye enables businesses to quickly analyze, optimize, and govern the digital processes they have automated with the Nintex Workflow Platform. The latest innovation in Hawkeye is the Inventory Lens, a pre-built dashboard that provides actionable insight to business and IT leaders to optimize automated processes. With Nintex Hawkeye, virtually anyone in the business can unlock the benefits of business process intelligence using the same no code, drag-and-drop design approach as the entire Nintex Workflow Platform, and without reliance on IT. "It's a business axiom that you can't manage what you don't measure," says Nintex CTO Alain Gentilhomme. "At Nintex, we take that a step further – you can't optimize what you don't measure. If enterprises don't start moving beyond process automation to focus on optimization, they will not progress on the digital transformation journey." Myriad Technologies Founder and CTO James Milne, winner of the 2017 Nintex Partner Award for Process Intelligence, says, "We see the immediate value our customers receive when we design and deliver automated processes with the Nintex Workflow Platform. The addition of the new Inventory Lens for Nintex Hawkeye, adds yet another powerful tool for our enterprise customers as they take the next step in process automation to process optimization." One of Myriad and Nintex's premier customers is Hawke's Bay Regional Council (HBRC), a regional authority in New Zealand, responsible for natural resource knowledge and management. Myriad has helped HBRC to utilize the full capabilities of the Nintex platform to deliver business solutions and realize immediate efficiencies. "We've become more agile as a business; paperwork is now digitized, business processes are streamlined, and day-to-day processes are automated to make our staff more efficient," says Anthony Gouder, Digital Transformation Team Lead for Hawke's Bay Regional Council. "By automating our processes with Nintex workflows and forms and optimizing them with Nintex Hawkeye, we have freed up about six full-time equivalent positions, which allows our staff to focus on more important strategic work like the impact climate change will have on our regions resources." Governance – know where, how often, and how smoothly workflows are running, across all environments to know which ones require attention. Assess Expertise – understand workflow ownership and designer proficiency throughout the organization. Workflow Status – discover the reach and impact of workflows, then drill into specifics of action usage and status trends. "Many organizations have little knowledge about how many processes and workflows they use to run their business, much less how well they are performing," says Carl Lehmann Principal Analyst at 451 Research. "Tools like the Nintex Hawkeye Inventory Lens provide the visibility needed to enable awareness and help improve business operations." The Inventory Lens for Nintex Hawkeye sets a new bar in self-service analytics, one of the most important trends in business intelligence today. It gives people throughout the enterprise enhanced ability to analyze, optimize, and govern business process performance. With the power of process intelligence available at the click of a mouse, information workers no longer have to immerse themselves in data, build custom reports, or consult business intelligence gurus for answers. Nintex Hawkeye lets users easily connect workflow data and share intelligent dashboards using best-in-class visualization tools. Customers can easily extend Nintex Hawkeye to leading business intelligence tools such as Microsoft Power BI and customize Power BI dashboards in order to visualize the data that best suits their needs. The new Inventory Lens joins the two existing Hawkeye pre-built dashboards: the Usage Lens, which provides an aggregated view of an organization's use of the Nintex Workflow Platform across all environments, and the Process Intelligence Lens, which enables customers to add the business context unique to their organizational processes and truly understand business impact. Together, all three Lenses affords Nintex customers the insights to get the most out of their existing automated digital processes, as well as identify other workflows well suited for automation. To learn more about Nintex Hawkeye visit www.Nintex.com/hawkeye or see Nintex representatives at Microsoft Ignite, booth #1301 during Expo Hours from September 25-29 in Orlando, who will be demonstrating Nintex Hawkeye in action. Nintex is the recognized global leader in workflow and content automation (WCA) with more than 7,000 enterprise clients and 1,700 partners in 90 countries who have built and published millions of workflow applications. With its unmatched breadth of capability and platform support delivered by unique architectural capabilities, Nintex empowers the line of business and IT departments to quickly automate hundreds of manual processes to progress on the journey to digital transformation. Nintex Workflow Cloud®, the company's cloud platform, connects with all content repositories, systems of record, and people to consistently fuel successful business outcomes. Visit www.nintex.com to learn more.